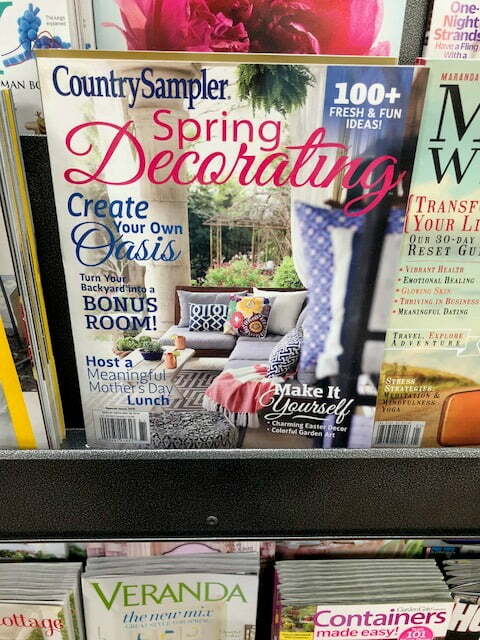 I am so delighted and honored to announce our Spring Decorating Country Sampler magazine feature! Can you squeal with me? 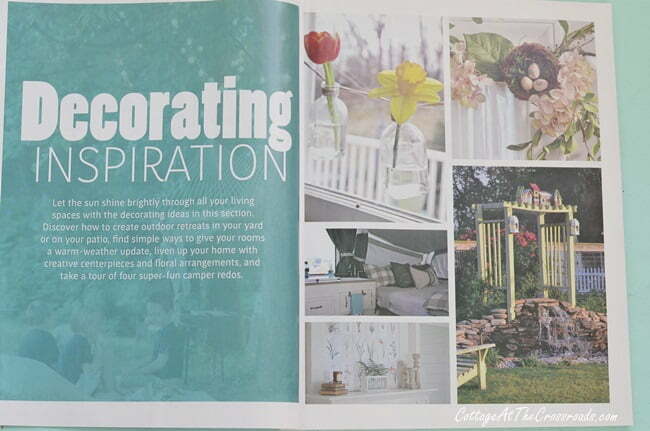 This magazine is bursting with DIY ideas to celebrate spring and includes garden and outdoor living inspiration. It was our DIY pond and waterfall project that was featured! In the photo above, you can see it in on the bottom right. And here it is on another page. Eeek! When I found the issue on the stands, I was so excited that I had to snap a photo with my phone. It never ceases to amaze me to see our work featured within the pages of a magazine. This Spring Decorating Country Sampler magazine feature and the garden waterfall project would not have been possible without the sponsorship of the smartpond, the company that creates DIY pond and fountain supplies that are sold at Lowe’s. We built the pond and the waterfall 3 years ago, and it has given us and everyone who passes it by so much pleasure. It is our absolute favorite DIY project that we’ve ever completed. So I went outside a few days ago and took some photos of what the waterfall looks like today. 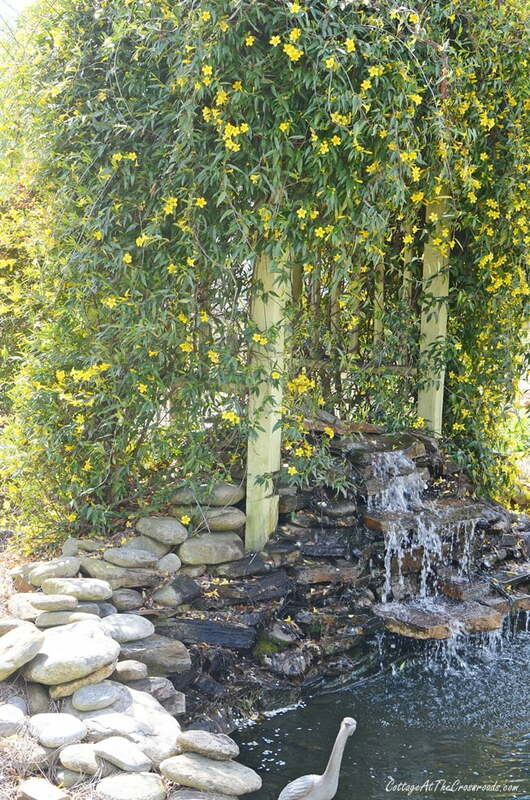 If you remember, we planted 2 yellow jessamine vines beside the arbor behind the waterfall. Just look at them now! They have totally covered the arbor and are in full bloom right now. 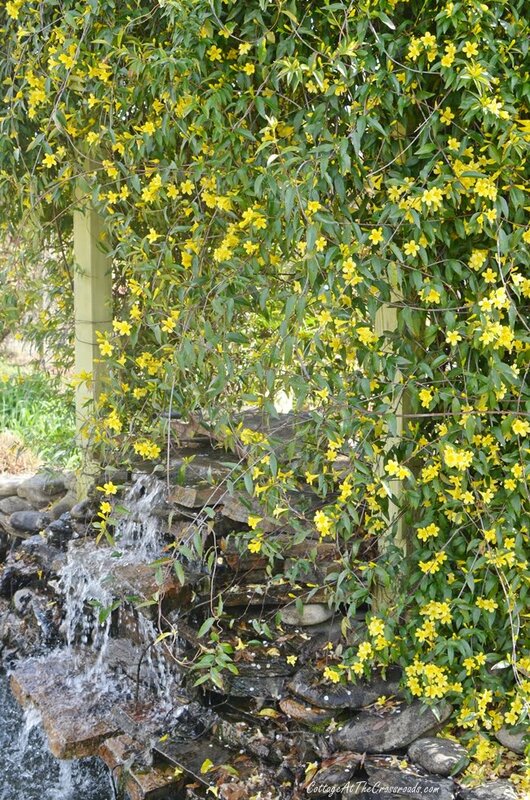 The yellow jessamine is our state flower, and when you see it blooming, you know that spring is on its way. After it finishes blooming, Leo will give it a “haircut” and clean the pond and surrounding area. We have plans to put some stone around the fire pit that is in front of the waterfall, get the Adirondack chairs repainted, and possibly put up a pergola. To see what the waterfall looked like in the beginning and to read about how it was constructed, click on any of the following post titles. 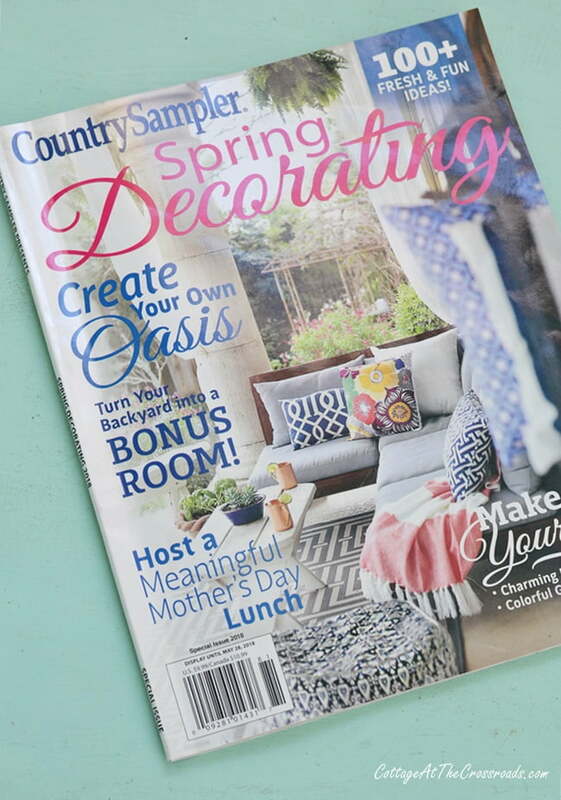 We are so thrilled about the Spring Decorating Country Sampler magazine feature! 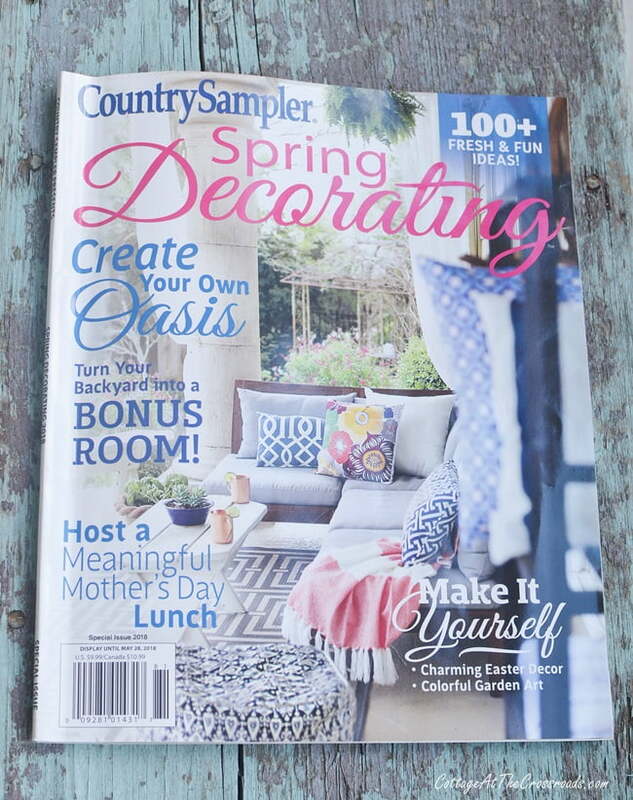 Thank you, Country Sampler, for including us in this beautiful issue. A copy can be found at your local news stand or you can order a copy here. We just loved your little waterfall oasis! We were thrilled to include it, and I hope it inspires many others to create their own little secret spots in their backyard. How exciting to see your work in a magazine!!! Yes, it is! I’ve been a magazine freak all my life and to find ourselves in a magazine is super exciting! Another option, which also adds a layer of privacy, is to train flowering vines to go over an arbor bench. How exciting! I’d be tickled too and would buy up a bunch of copies for friends and family, plus one to frame! 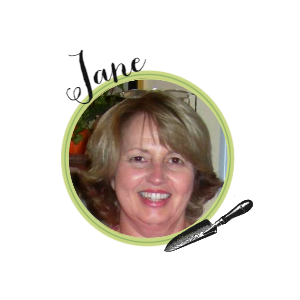 Your waterfall project is a beauty and one you will appreciate always! I am squealing. Can you hear me? Your place is so beautiful so I can see why you would be in the magazine. That yellow jessamine is just gorgeous. Congratulations Jane and Leo!!! That is SO very exciting! 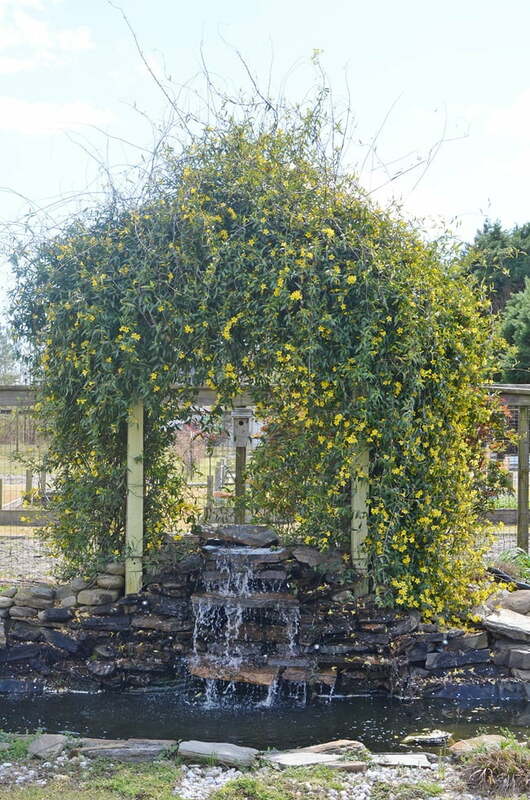 As pretty as the photo is in the magazine, the arbor and waterfall are ten times as beautiful now with the yellow jessamine in full bloom. Just gorgeous! Wonderful! 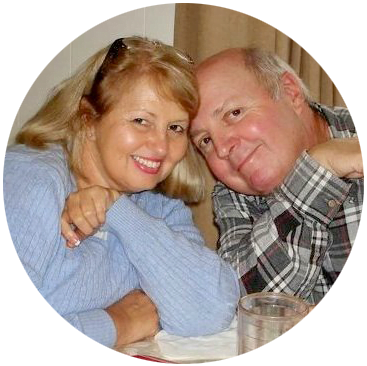 And well deserved recognition as y’all are an inspiration of creativity and showing all that a couple can do when they work together to create an amazing life! So beautiful! I know you enjoy it so much. It is great it made the magazine. Congrats to you and Leo!!! 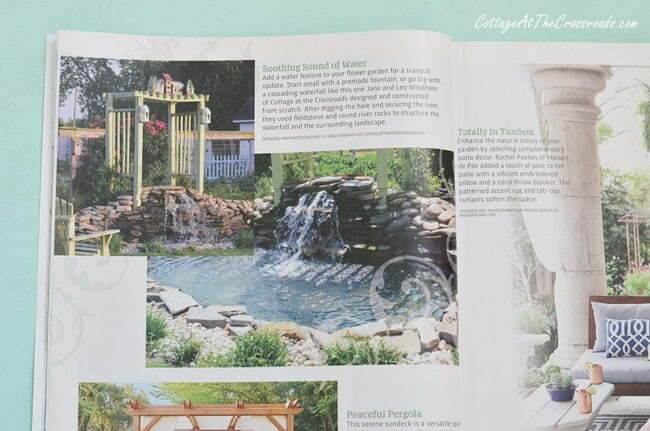 Your DIY waterfall and pond projects is one of my favorites….I will be looking for this issue on the stands!! Have a great weekend!